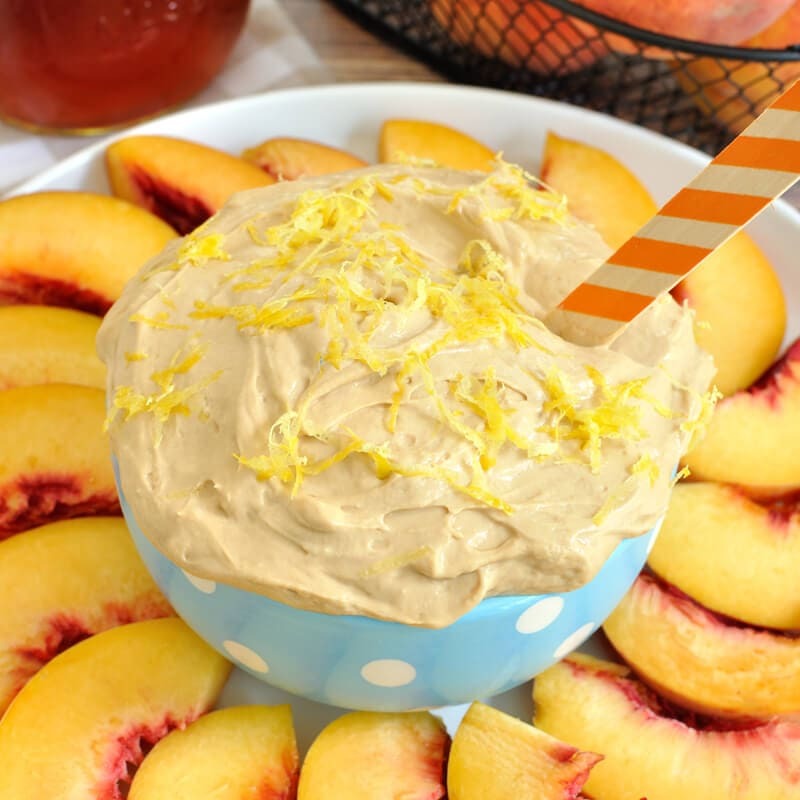 August 22 is National Eat a Peach Day and this sweet tea fruit dip is the perfect compliment to go with some juicy peach slices. 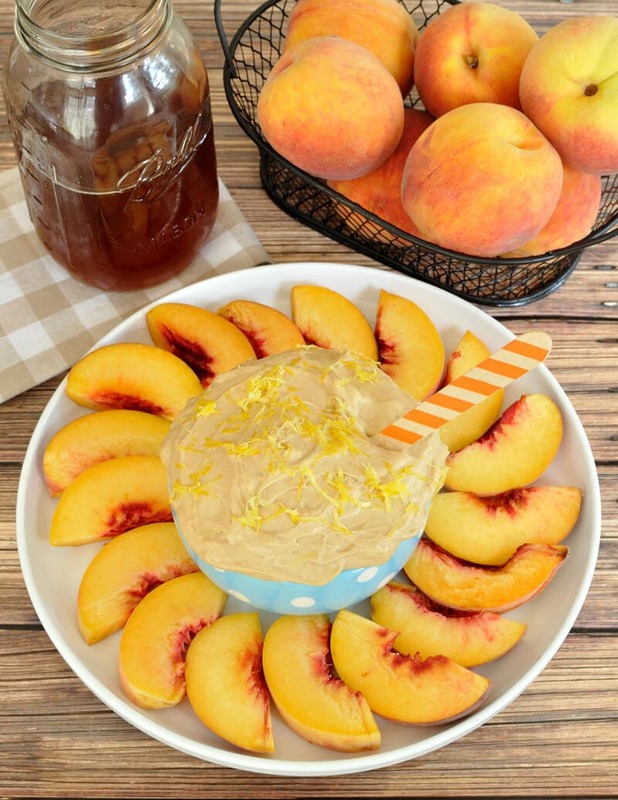 Peaches make for such a beautiful presentation too! Doesn’t this spread look stunning? 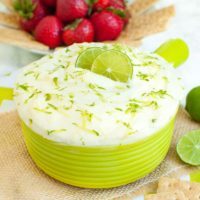 Think how amazing this would look on a summer brunch table or on a buffet for an afternoon shower. To be honest, I do not like sweet tea or un-sweet tea for that matter. I’ve tried and my husband jokes that it’s just not American, but I just can’t do it. It is a taste that I have never acquired for some reason. Do you ever reach for your spouse’s cup to take a sip of their drink thinking it’s one thing only to find out that it’s something else? I’ve done that when my husband has had a sweet tea and I actually make quite the funny face. 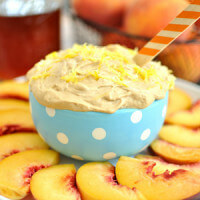 However, add the flavor into a sweet tea fruit dip and serve with peaches and I’m all over it! So even if you are not a tea fan, you should still give this one a try because it is yummy. which I found in my local grocery store in the tea section, but can also be ordered on Amazon. 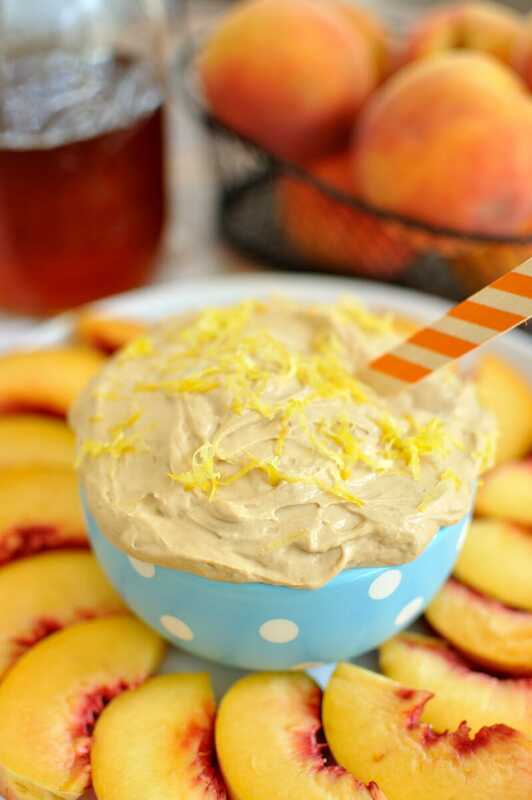 Strawberries, lemon cookies, wafers, or even graham crackers would also be good dipped into this sweet tea fruit dip. This recipe can be made a day or two ahead of time and stored in the refrigerator until ready to serve. I think it actually tasted better the second day since the tea flavor really had time to infuse the dip. 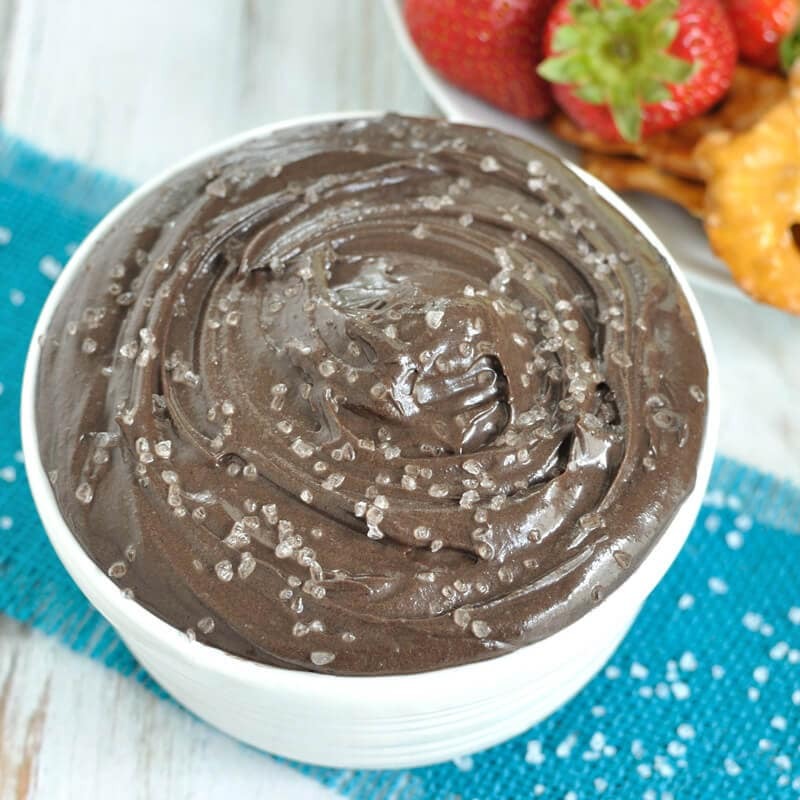 In a small metal bowl, pour the heavy cream and add in the instant tea mix. Using a mixer, beat the cream until soft peaks form. Set aside. In a separate bowl, add the cream cheese and lemon juice. With the mixer on medium speed, slowly add in the powdered sugar and mix until creamy. Gently fold in whipped cream mixture until well combined and no streaks remain. Store in an air tight container in the refrigerator until ready to eat. Top with lemon zest right before serving (optional). Dipper Suggestions: peach slices, strawberries, lemon cookies, wafers, graham crackers. What a clever idea! 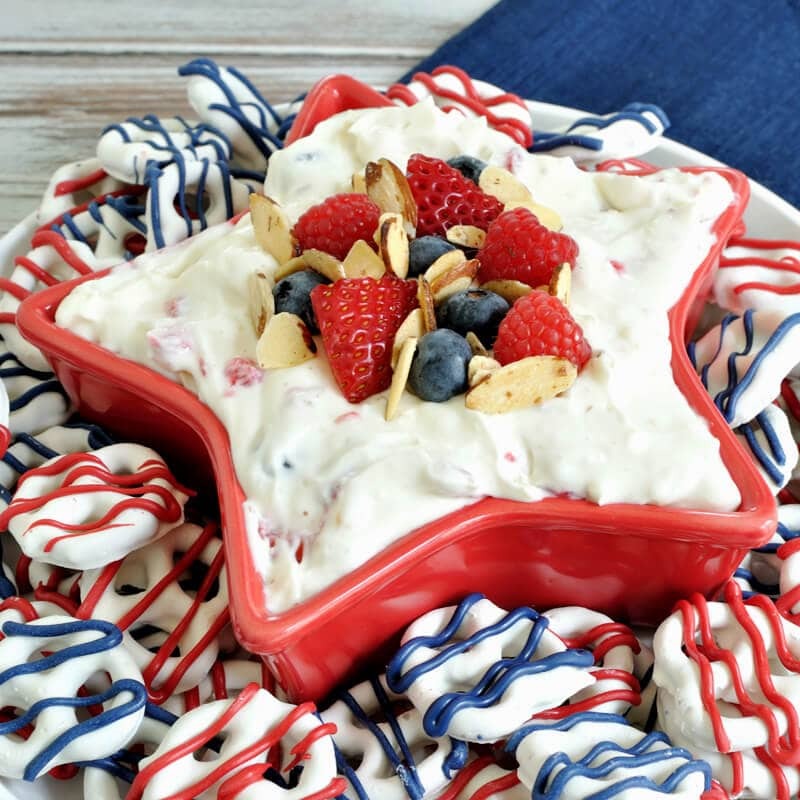 These dip looks delicious. It must be yummy with all these peaches! This looks so tasty!! 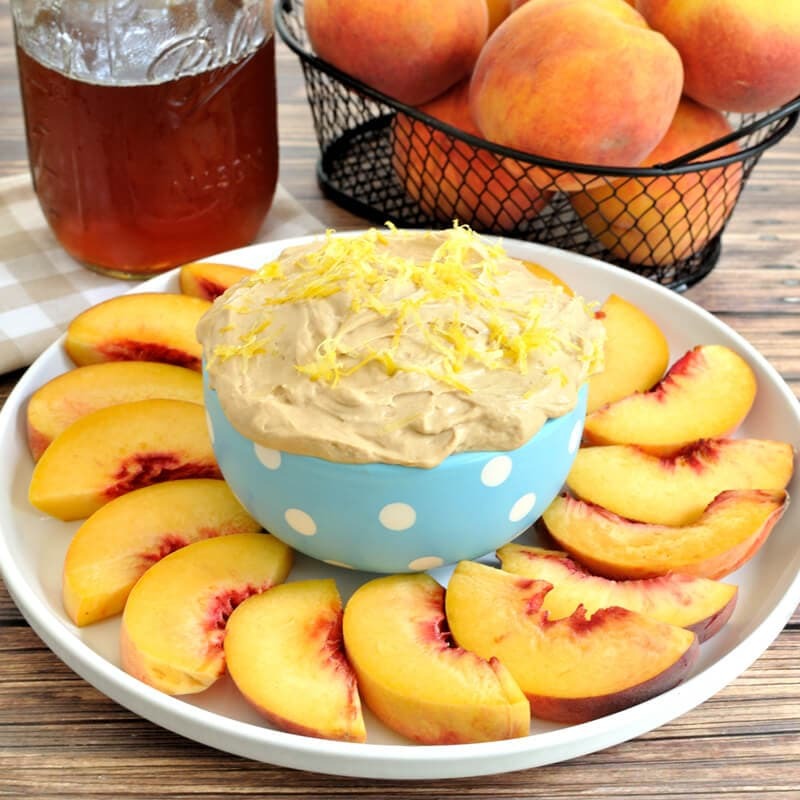 I love sweet tea and peaches…I could fall in love with this dip FAST! This is just…wow..interesting! Never would I EVER have come up with that! Looks great, though!